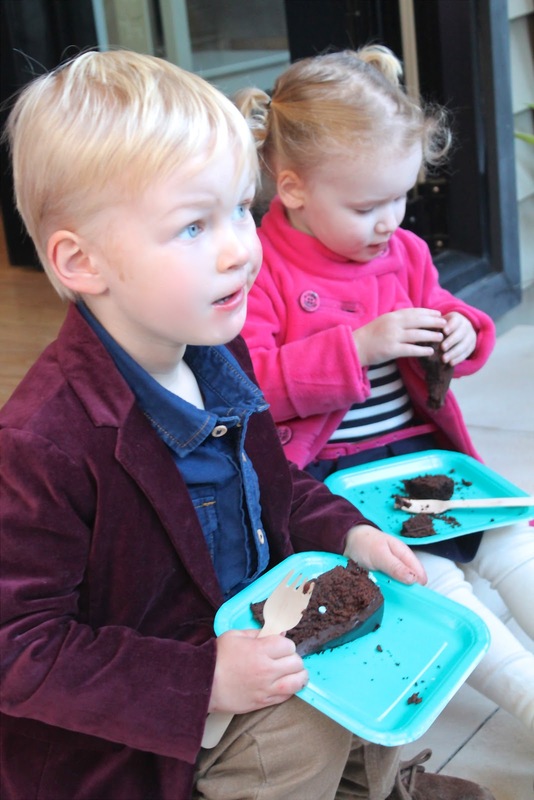 The thought of my son’s birthday party excites me every year - & this year Will was excited too. After he had celebrated a few birthdays with his friends, he was asking when it was going to be his turn. He was asking for his “Hoot” owl cake from last year, so I explained we had to do something SUPER exciting & new this year. I knew I wanted to create something really special for him. When trying to narrow down the themes that he could possibly have, I asked him a few questions. “What kind of cake would you like this year Buddy?” He looked at me blankly. Nothing. “Would you like a whale?” he loves whales as they are in a Charlie & Lola book that he has. “Whale!” He said excitedly. “Ok, a whale cake it is then” I replied, proud that I actually got an answer out of him so quickly. He then piped up, “Crabby” clipping his hands together above his head, like a crab. “So you want a Crabby Cake then?” I asked him. We were back to deciding the theme again. He then said “Octopus!” waving his arms about. “Huh? An octopus cake?” Ummm…. that was going to be an interesting one to make. “Fish-Star!” aka starfish. He then looked around & noticed the box of cooking flour that I had on the bench top. “Lighthouse!” he squealed, pointing to my Lighthouse branded flour. “A lighthouse cake, are you sure?” I asked him, not knowing how I was going to do that one. He replied “Big, tall, lighthouse cake!” with his arms out wide. From then on, his mind was set. All the things he mentioned weren’t quite “Under the Sea”, “Seaside” or “Gone Fishing”, but I knew I had to tie in all these elements to create something that was truly Will. 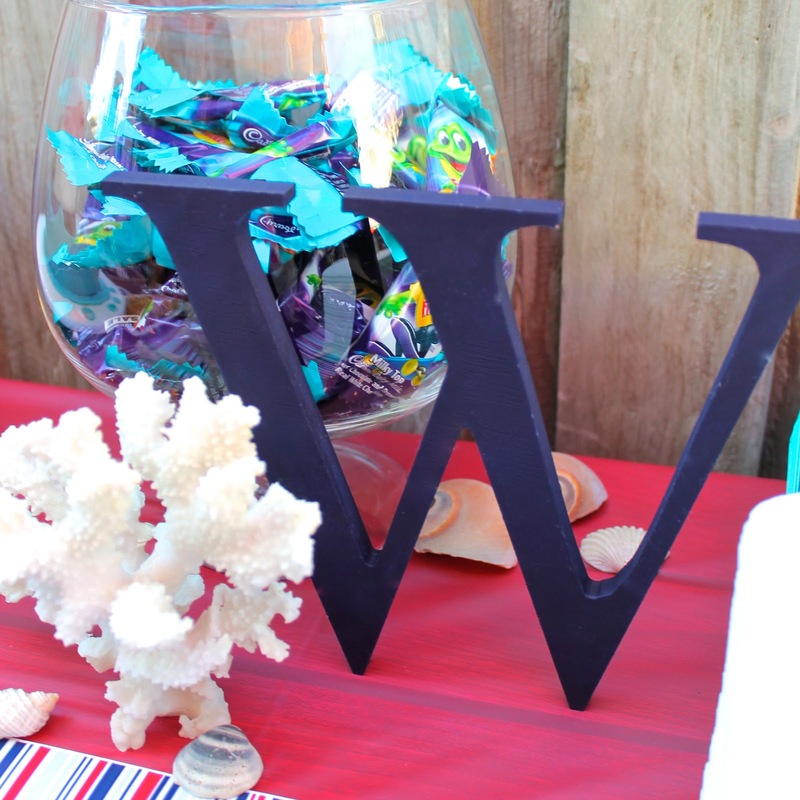 With all of my little man’s answers in mind, I decided on a nautical “By the Water's Edge” theme. He was happy with that & loved the idea too. I am so lucky to have a good friend that has her own specialised Occasional Stationary business called SAJARO. She creates simply beautiful invitations for Weddings, Birthdays & other special Occasions. I emailed Sam my ideas & colour theme for Will’s party & she developed this gorgeous hand crafted invitation for me. What a talent! From this creation I was inspired. I designed my cake, cupcakes, theme & decorations based on this delightful invitation. SAJARO Occasional Stationery produces unique, personalised invitations & party accessories for any theme for local, interstate & international customers. 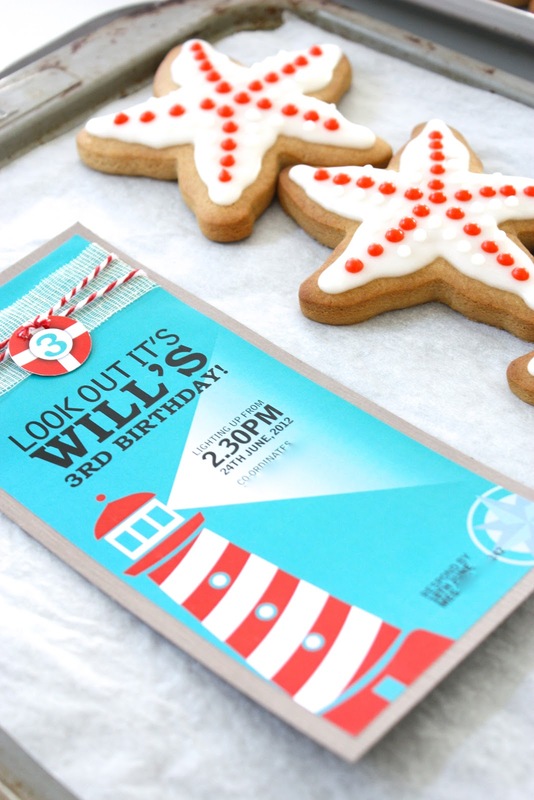 Starting with an idea for the theme you want they can design elements such as invitations, place cards, name tags, food labels, bunting cutouts & other printable stationary of choice. Visit SAJARO at their Website or Facebook Page for more inspiration. After Will requested his Lighthouse Cake, I had to put my thinking cap on & also do some research. 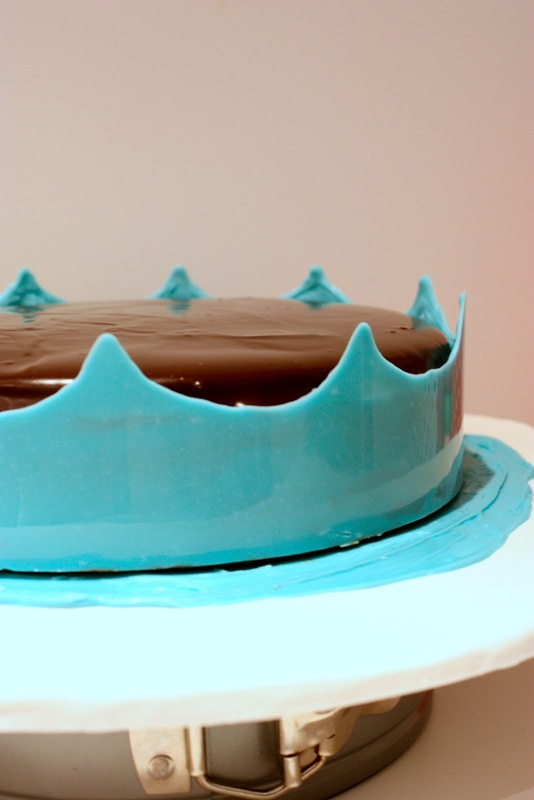 In the beginning I had wanted to do a combination of red & blue velvet for a WOW effect when you cut into it, but after a conversation with the good people at Sugar Rush, I decided to go with a more durable & solid cake of a classic Chocolate Mud recipe. Not to mention that it’s Will’s favourite. He would consume chocolate cake by the truck load if I let him! 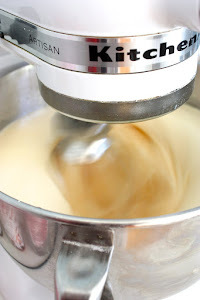 Making a double recipe, my poor KitchenAid Artisan Mixer almost couldn’t cope! Although it was filled to the top with mixture, I had faith & pushed through. 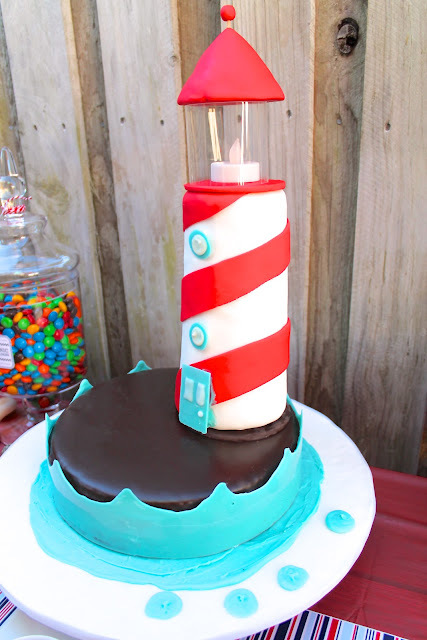 I made a round 22cm cake for the base & used a square tin for the cutouts of actual lighthouse. I poured a smooth chocolate ganache over the top of the round cake & let it fall evenly over the sides, then let it cool. While things were chilling, I covered a cake board with white fondant & smoothed out a disc of blue chocolate for the cake to sit on. I then placed it on a prepared board. For the waves, I used some more melted blue chocolate buttons from Wilton on a sheet of clear plastic acetate & bent it around the cake, leaving it to set then removed it, allowing it to adhere to the cake. The actual lighthouse was a bit more complicated. I punched out 4 large round circles, layering it with chocolate ganache in between each layer. This was placed on a small silver cardboard cake board with a hole drilled in the middle. I then put a large piece of cake dowel down the centre of the cake & through the hole in the cardboard, so the skewer was exposed at the bottom. I then covered it & placed it in the freezer. Once set, I pulled it out & shaved some cake off with a sharp knife to give it conical shape more like a lighthouse. Back into the freezer it went. Once the cake was solid & frozen again, I took it out, placed it onto a solid glass (so the bottom of the skewer had somewhere to go) & covered it with some white fondant, featuring it with red stripes, trying to match the invitation. For the top of the lighthouse, I shaped another piece of frozen chocolate cake & covered it with red fondant. The “glass” round of the lighthouse was made out of clear plastic acetate & I borrowed a battery powered tea light from a friend for the light. I fashioned some windows & doors out of some leftover blue chocolate, so it looked similar to the lighthouse on the invitation. I then picked it up & pushed the lighthouse (with the skewer poking out bottom) through the base cake so it wouldn’t topple over. I assembled the plastic tube for the glass & lighthouse roof a few hours before the party. Having never made anything this difficult before, I was amazed that I figured it out & pulled it off! It was quite a thrill seeing the finished product. I love creating cookies. There is something so special about having an edible decoration themed to whatever you desire. 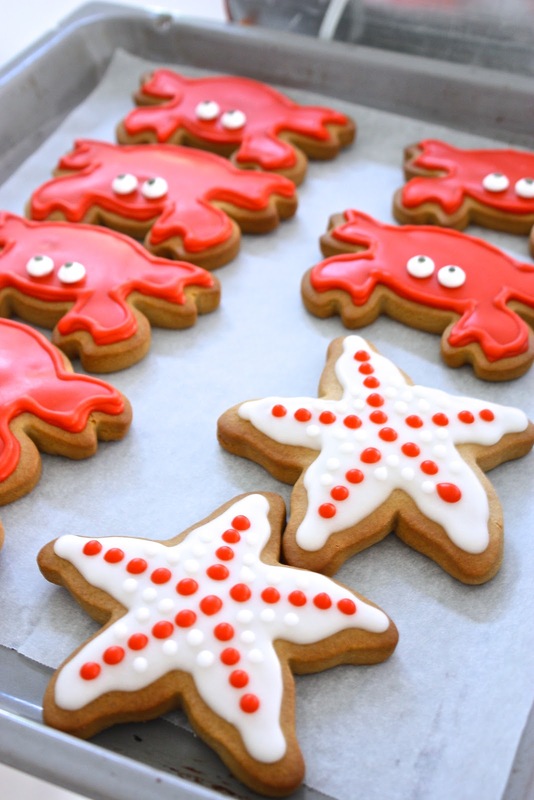 For the “By the Waters Edge” theme I made & individually packaged some Vanilla Bean Gingerbread novelty cookies in the shapes of x-large Crabs & Starfish. 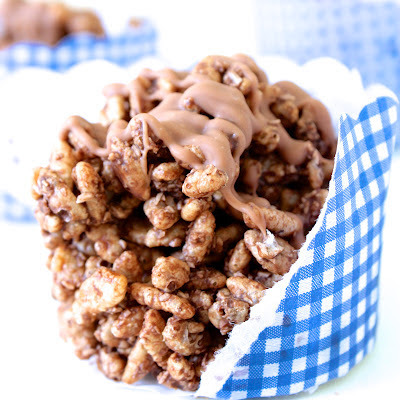 These are always such fun to create & a hit with the kids & parents alike. I pre-ordered the crab & starfish cookie cutters from Coppergifts.com in the US. I bought some cello bags & tied with some feature butchers string & viola! A delicious cookie & decoration to eat on the spot or to take home for afternoon tea. You always have to have a healthy option, right? For the slim sailor I made some fruit cups. This was simply a plastic cup with newspaper around it stuck with some double-sided sticky tape. I featured it with some butchers string tied at the top & filled the cups with strawberries, blueberries, raspberries, watermelon & another favourite of Will’s, apple. Will also adores watermelon & eats mounds of it. I had seen something really clever online so I imitated it with some Fishy Watermelon Sticks. I simply sliced some watermelon then pressed out fish shapes using a cookie cutter. I stuck them with an extra wide pop stick & that was it! It really couldn’t get any easier & you could do any solid shape that you like. I, again, sourced my cookie cutter from Coppergifts.com. I had some children coming who had food allergies, so I had to make a nut free/egg free option so they didn’t miss out on the seaside fun. I ordered some cupcake toppers though a talented lady from Cupcakes For You who sent them through the mail. Some broke in transit so I had to do some fancy mending work on the fly, but if you are in Brisbane, I highly recommend this business. For the cupcake recipe I used my sister’s Allergy Free Chocolate Muffin recipe with a buttercream icing made using Nutellex. What to eat when your party is By the Waters Edge? Fish & Chips of course! I purchased some fish fresh from the markets, cut them into fingers & crumbed them. I froze them in advance & took them out the night before the party. 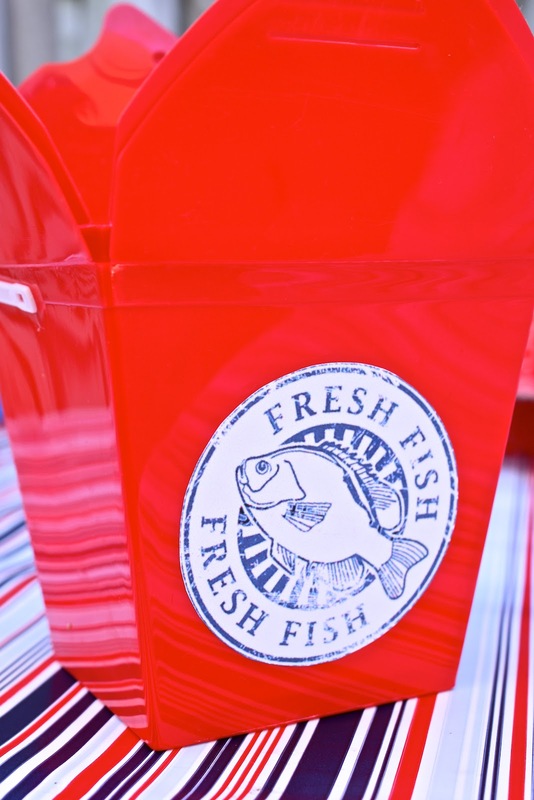 I bought some plastic red takeaway boxes from a discount store, stuck on a label & filled them with home made hot fish & chips with a little cup of sauce - a hit at the party! 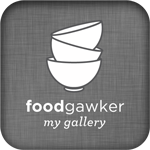 See my site for the crunchy chip recipe. ALL kids love ice-cream, especially my son. It is his favourite & so easy to make in advance. I made the Megann’s Kitchen Berry Good Ice-Cream the week prior. 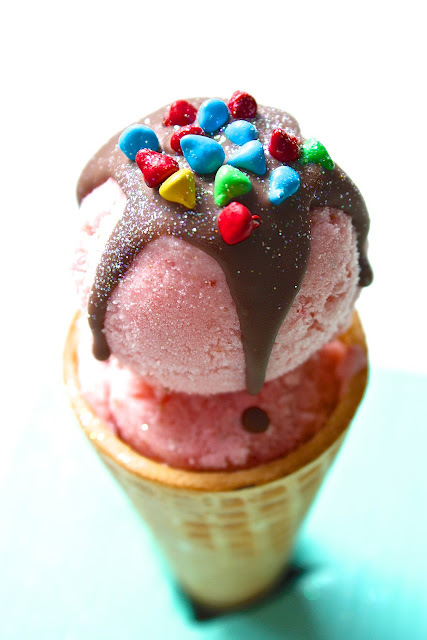 I also bought some mini wafer cones & edible decorations from the supermarket. I cut some star shaped holes in a shoe box so I could make them en masse – as we all know how exciting ice-creams are to 3 year olds. The girls (& boys) particularly loved the sea dust (edible glitter) that I sprinkled on top for a special touch. When I found some decorative jars at a local discount store I couldn’t resist. It just so happens that Freddo Frogs were in my theme colours, so I placed a few packets into a fishbowl. I also placed some “W&W’s” (or M&M’s) in a jar to nibble on that were also great for colour. I can’t have a party without Chocolate Crackles… I think it was because I never had them as a child!!! They are so simple to prepare as well. I made them following the instructions on the copha packet & added an additional 100g of dark chocolate to the mixture & an extra cup of Rice Bubbles. I also melted about 100g white chocolate & 5 Tbs Nutella together & drizzled that over the top – yummo. It seems it isn’t a party at my house unless I have enough to feed an army. I also prepared & froze some home-made Sausage Rolls, Satay Sauce & Skewers & Muesli Bars along with the above Ice-Cream & Fish Fingers. On the day I made some Pop-Corn, Hot Chips, Jugs of Drinks & a Cheese Platter to go along with all the other tasty delights. Not to mention that everyone has to have dinner, right? Again, a pre-prepared & defrosted meal of Spaghetti & Meatball Sauce came in handy. Would you believe I had back up food that I didn’t even use? It made for great leftovers for the following week. Bottoms Up- I had some leftover San Pellegrino bottles that I had kept for such an occasion. I removed the labels in hot water & sourced some red/white vintage style straws from ebay, but they can be found in many shops these days. My friend Sam had also given me some extra “3s” leftover from the invitations, so I put some double-sided sticky tape on them & tied them with the feature butcher’s string. When required at the party, I filled them up with water, milk or juice. Caffeine Hit- Everyone loves a hot drink & no dishes. For coffee & tea later in the day, I bought some take away coffee cups from my local packaging supply store & labelled them with some nautical themed labels. A special touch for the special day. 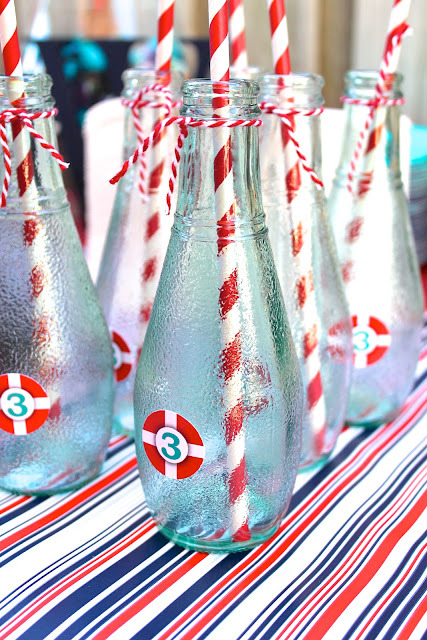 H2O Go- I set out water bottles with an anchor label on them… everyone drinks water & it goes fast at a party! I like having a splash of colour as decorations. I decided to order some tissue paper Pom Poms online as all my time was being absorbed in party prep. Outsource where you can, I say! The Pom Poms I bought from Mrs Pom Poms, an ebay store, in the colours themed to By the Waters Edge. They arrived quickly in a flat pack & one night I fluffed them out in front of the TV. I have since found a fantastic DIY option on Martha Stewart. I am going to give them a go for Halloween this year! I just LOVE buntings. When I see these they make me feel warm & fuzzy. I believe that they are the very definition of a party & celebration & add such flair. 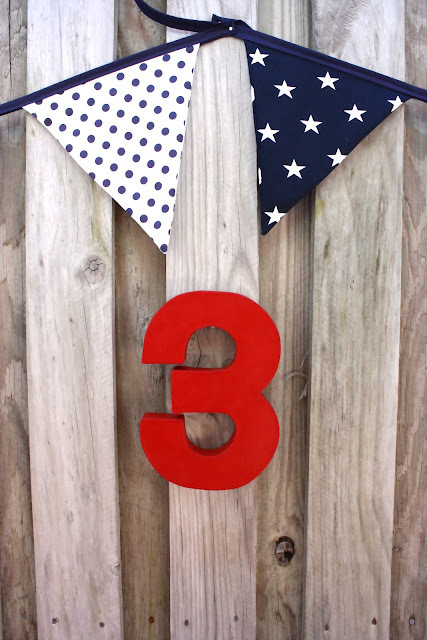 My wonderful sister made some fabric buntings for Will’s 2nd birthday, which were in his theme colours for this year. I have also made paper options in the past that are just as effective. I absolutely adore these ones as they are a keepsake & now are above Will’s bed in his room as he sleeps. Thanks Ros! I wanted to make some decorations that Will could keep in his room after the fun fare of his party had ended. I bought some inspirational words from Spotlight of “laugh, inspire & dream” – all things that I wish for my son in his life. I also purchased a “3” and a “W” & painted them in the theme colours… great for the tables & also for his room to embellish the walls. 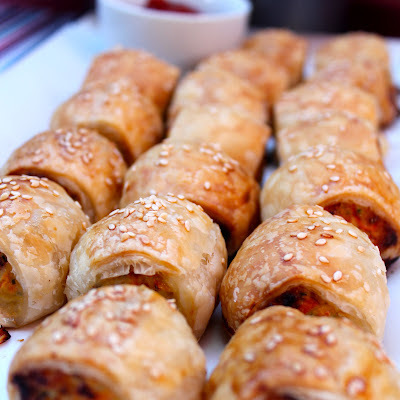 For the party favours, I figured I had enough food at the party & wanted to do something different. I found some Buckets & Spades at a discount store along with some stickers, so I had these in a basket to take home as the guests left. 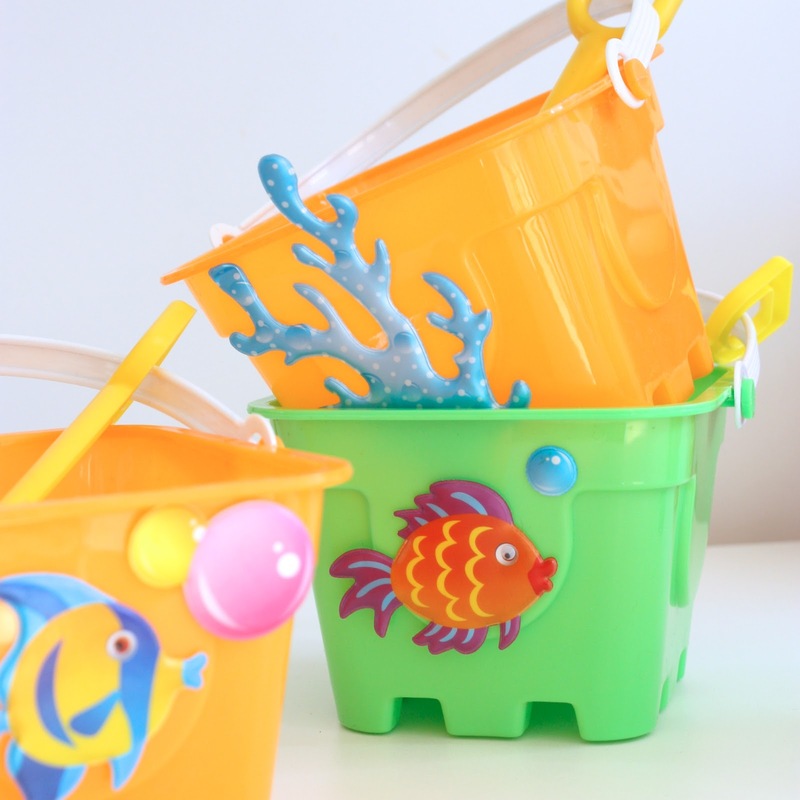 Gone Fishin’- I was into home made keepsakes for this party for some reason. 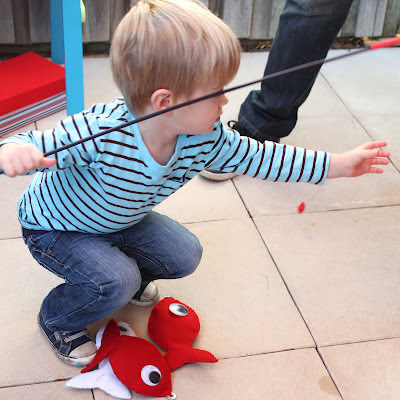 For entertainment I hand made a fishing game. I used a basic fish to trace around for each piece of felt and cut two fish out. I matched them up & sewed them together using the leftover scrap felt as stuffing, attaching a metal ring at the end & large googly eyes. I bought some dowel from the local craft shop & painted them in the theme colours. I also purchased some basic magnets, which didn’t look very attractive so I sewed a felt casing around it. Using different coloured string for the lines, I assembled it all together with a fishing float for a special touch. This was something I felt Will could keep for a long time & has brought much joy for him & his friends. 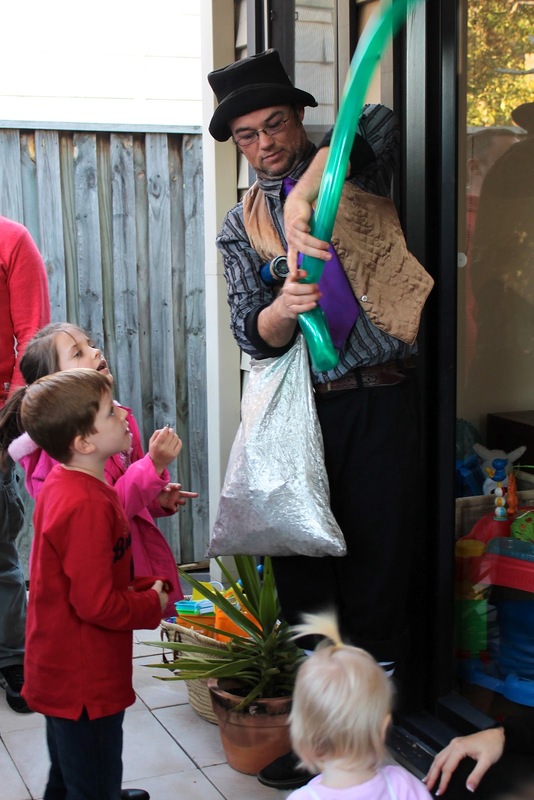 Performing Arts- We also hired a local Pirate Balloon man named Jonothan, who was worth his weight in gold at a 3 yr old party. 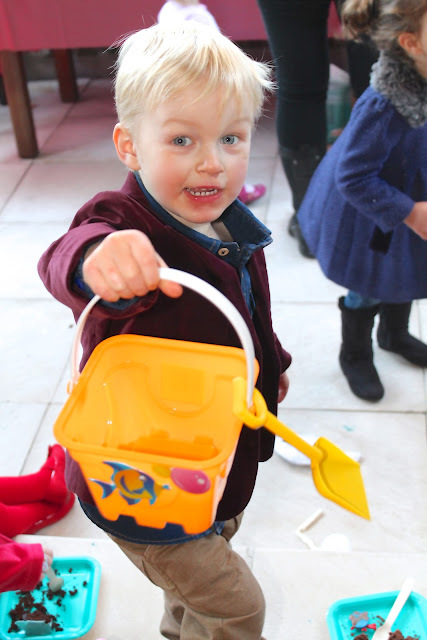 He also did face painting – a huge hit. When you are not sure what the weather is going to be, this sort of entertainment is priceless. Be PREPARED- I did as much as I could in advance. Food can be prepared & frozen weeks before the party date – just write a list & plan what you want to eat. Arts & Craft- Decorations, games, etc can be sourced & made in advance as well. I kept mine in a large box as I made them, ready to be set out on the day. Keeping Time- I also had a running sheet as a guide of what was to happen when on the fridge. That way, you knew what order & time that things should (technically) happen. Also, it was a great help for people pitching in for a helping hand. Enlist HELP- When it comes to delegating, I am terrible at it. It is so hard to “let go” of control & tell someone else (other than my husband!) what to do. Where you can, look at your list & see what others can assist you with so you aren’t a frazzled, sleep deprived mess on the joyful day. Special Mention- I wouldn't have these photos if it wasn't for my friend Sam. My camera was out of action so Sam brought hers along & spent time capturing these memories for me (and YOU!). Thanks beautiful lady - you are awesome! Why thank you for taking the time for writing feedback & so much for the encouragement! This was done for my son a couple of years ago now, and I realised how much I LOVED KIDS PARTIES!!! So much fun. 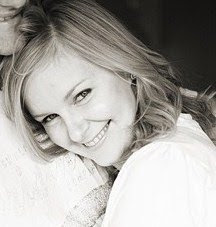 I have had some blogging time off to have another, beautiful baby (a girl) and plan to get back into it very soon! Stay tuned!